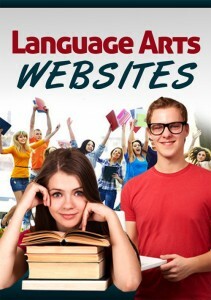 In this Language Arts ebook, read about sites that…. Have educational games for: Letters, Numbers, Shapes, Social Studies, Art and Holidays. Use them in your groups and centers. Support student writing with prompts for plot, setting, character, and personal response. Students can add a graphic before printing the final draft. Have a detailed media literacy curriculum with lesson plans, worksheets and support materials you need to teach the news. Go to the form on the sidebar and instantly download this free resource.